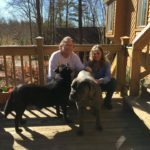 Fairy and her husband Rusty first contacted CPT in July 2014 regarding their then 8-month old Norwegian Elkhound littermates Smokey and Bandit. 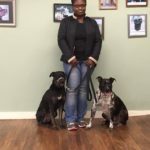 They were concerned about the dogs’ unruly household behavior, which included jumping, digging, stealing food, and bolting, their lack of adherence to obedience commands, and their pulling and apparent aggression when encountering unfamiliar dogs while walking on-leash. Fairy and Rusty completed one private lesson at CPT, then elected to convert to board training. Remi brought Ngoni and Luckie to the CPT Sandy Springs Training Center to address on-leash reactivity when they observed unfamiliar dogs. In one lesson, we conditioned the dogs to a reward marker, conditioned them to the Gentle Leader, taught them how to walk on a loose leash while wearing the Gentle Leader, taught them to become more attentive to Remi and less to the environment, and then separated them so that they could work individually amidst a volunteer dog. Becca and Inny demonstrating the Double Jump and the Tire Jump during a CPT Advanced Agility Class. 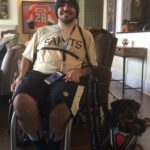 Inny is a fast, agile dog and Becca, a former Sprayberry High School soccer star, still remains fleet of foot, which is helpful when handling a dog as quick as Inny. 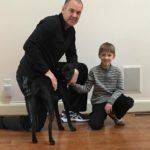 Larren and Charlie, age 9, participated in an in-home lesson with their Black Lab Mix, Shadow. Shadow learned how to sit, come, greet people at the door without jumping, and walk properly on a loose leash. The highlight of the session was when young Charlie walked Shadow about the neighborhood with a big smile on his face- and a nice loose leash. Who Says America Isn’t Training Scientists? Who Says America Isn’t Training Scientists? The accompanying photo shows (l-r) Celeste Mason, Piper Vornholt, Ceara Byrne, and Larry Freil of the Georgia Tech Human/Animal Computer Interaction Laboratory. 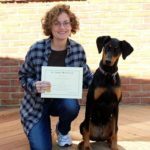 Another CGC Graduate- With a Nice Story! 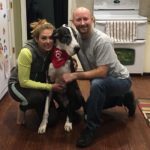 When Steve and Brittany first contacted CPT about Shamu, their 6.5-year old Great Dane, they were worried about Shamu’s reactivity and apparent object guarding when Brittany walked Shamu in the neighborhood. They also were concerned about destructive chewing that originated from Shamu’s separation distress. Congrats Rio on Becoming A Certified American Kennel Club Canine Good Citizen! Although Rio was always a good dog, now she is a certified American Kennel Club (AKC) Canine Good Citizen. 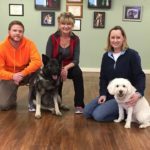 Sandra and Rio were one of 12 human-canine teams that graduated from a recent CPT CGC Class. And even with all of Sandra’s accolades as a track star for Darlington High School and Auburn University, she considers receiving Rio’s CGC certificate as one of her greatest honors. 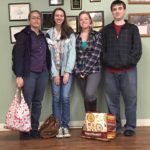 The Georgia Tech Brain Lab’s FIDO Project team visited CPT on SU Feb 8 to work with The Dog Project dogs. 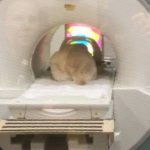 The FIDO Project is participating in a 2-year canine neuroscience study coordinated by Dog Star Technologies (www.dogstartechnologies.com). As part of the study, the FIDO team is developing sensors that will aid in determining the temperament of a dog by how the dog interacts with each sensor product. Presently, there are two sensor products in the prototype stage, a ball sensor and a tug sensor. 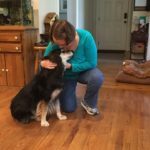 Maya is a 6-year old Australian Shepherd Mix that Carolyn has owned since Dec 2014. We worked on helping Maya to better enjoy time with Betty in the backyard, extinguishing pawing as an attention seeking behavior, Come, Sit, and Leash Walking. Carolyn and Maya both learned a lot and built a better relationship in the process. 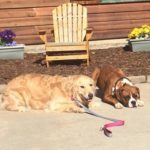 Shelby the Golden and Bubba the Boxer completing down-stays while board training with CPT Trainer Megan Sinteff Jefferson. Megan provides a wonderful, bucolic multi-acre experience for the dogs to learn and play. Next time you go on vacation, don’t let your dog veg at a kennel. Board train your dog with CPT! 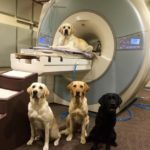 This past week Mark Spivak, Greg Berns, and Andrew Brooks of Dog Star Technologies visited the University of California, Berkeley to conduct fMRI scans of 7 dogs that recently entered the Canine Companions for Independence (CCI) adult training program. The 7 scans that occurred over the weekend of Jan 31- Feb 1 were the first of 50 total scans the group will analyze over a 2-year period. Gracie, a 10-month Cane Corso, is very friendly. But, she can be an excitable territorial handful when she is behind a gate or fence or when she is on-leash in the neighborhood and sees unfamiliar people or dogs. Therefore, we worked on leadership communication, impulse control training, acclimation to the Gentle Leader, leash walking mechanics, and establishing a calm greeting protocol. There is still work to do. However, we made tangible impact after just one session. 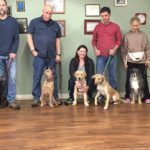 CPT Beginner Obedience graduates: Caleb and Chip, BJ and Sophie, Catherine and Henry, Glenn and Jessie, and Debbie and Aries. They all learned a lot- and they had a lot of fun! Now, on to an Intermediate Class, where they will transition on-leash skills to off-leash proficiency. Whatever You Can Do I Can Do Better! 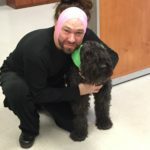 Whatever you can do I can do better!” Emory University neuroscience professor Danny Dilks poses with Stella the Bouvier before she enters the MRI for the “Danny-Faces” experiment. Stella wears ear plugs covered by vet wrap to provide hearing protection once within the MRI. Danny wears vet wrap simply because he is well coiffed. The Danny Faces experiment is designed to identify the canine FFA (fusiform face area) and to better understand the operation of the canine FFA. The FFA is responsible for facial identification and processing. The first photo shows Kady observing non-facial stimuli. The second photo shows Kady observing facial stimuli. By analyzing brain activity that occurs exclusively upon exposure to the still photos and video of faces, as compared to the non-facial images, we can locate the FFA! Why is Amy smiling? Because she just completed a successful private lesson with Comprehensive Pet Therapy! 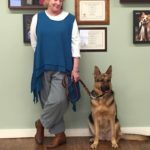 Prior to the appointment, her German Shepherd Bailey pulled constantly on-leash and became reactive whenever she saw an unfamiliar dog. The behavior became worse after a friend’s dog started a fight with Bailey. One time during a walk Bailey literally pulled Amy over and dragged her on the ground. 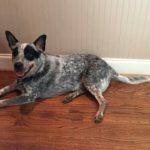 Storm is a 2.25 year old Australian Cattle Dog. Prior to our in-home appointment, Storm would obstreperously and compulsively pace, circle, jump, bark, and nip whenever his owners poured juice, took plates/bowls/pots from the cabinet, or talked on the phone.